/EIN News/ -- Ford Island, Honolulu, Hawaii, March 25, 2019 (GLOBE NEWSWIRE) -- In its recently-released “Notice to Airman” (NOTAM), the Pearl Harbor Aviation Museum (PHAM) announced a $1,000,000 Challenge Grant from the Ray Foundation to develop a new educational resource for Hawai’i youth. The Ray Foundation will match other donations up to $1,000,000 to create a Learning Lab designed to use the excitement of aviation to inspire the passion of young people for Science, Technology, Engineering and Mathematics (STEM). The Learning Lab will reside in a renovated historic building near the Museum’s main facilities on Ford Island. View of the structure now, and a rendering of the Learning Lab after the structure undergoes renovation (bottom right). “This challenge grant is a great opportunity for PHAM to expand its contribution to the community,” said Elissa Lines, Executive Director of the museum. “We are off to a great start thanks to generous donations at our annual Gala dinner in December.” The grant is contingent upon matching donations from other non-profit organizations, businesses, and individual donors. Matching the full amount will make $2,000,000 available for the project and allow the Learning Lab to open as scheduled in late 2020. The new Learning Lab at Pearl Harbor Aviation Museum provides an opportunity to introduce a new generation of Hawaii’s youth to the history and technology of flight, introducing them — through that experience — to a variety of STEM industries. Their experiences will be rooted in relevant, authentic activities powered by state-of-the-art technology to teach timeless fundamentals applicable to a wide range of careers. Students will use lessons learned to help construct their own future. “Our vision is to advance education and leadership opportunities for students in Hawaii by creating a Learning Lab. 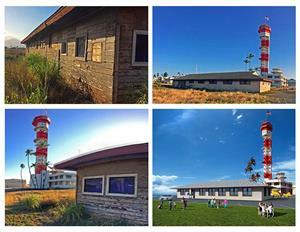 Working with our Navy partners, an existing WWII pilot training building, adjacent to the historic Ford Island Control Tower, will be renovated and converted into a modern-day center for young people. Our plan includes installation of the innovative – and highly-successful – Aviation Learning Center model developed by the Seattle Museum of Flight. This learning environment uses flight simulators, and other technology tools, to engage students in their own learning,” said Pearl Harbor Aviation Museum Executive Director Elissa Lines. James C. Ray witnessed the attack on Pearl Harbor as a young steel worker, enlisted in the Army Air Force, and served as a B-17 pilot in the European theater earning two Distinguished Flying Crosses and multiple Air Medals. The Ray Foundation sustains his vision of inspiring and educating America’s youth through aviation. Pearl Harbor Aviation Museum is located on Historic Ford Island, where bombs fell during the attack on Pearl Harbor, December 7, 1941. Walk on the Pearl Harbor battlefield where the attack began, enter the bullet-scarred hangars, see the control tower and aircraft of the battle, Including a Japanese Zero and the B-17 Swamp Ghost. Hear the stories of WWII heroes and their response to the attack that changed our nation and the world. Tour Included, flight simulators and café available.